There was a remarkable answer given by Facebook CEO Mr Mark Zuckerberg earlier this year, when he was asked to appear before the UK parliament following the data privacy scandal involving Cambridge Analytica. Mr Zuckerberg respectfully thanked the UK politicians for their invite but stated that he would rather focus on the upcoming elections in India and Brazil. He did however appear before US congress and the EU commission to answer questions. Related coverage: <a href="https://thegoldwater.com/news/34748-New-York-Times-Editorial-Illegally-Promotes-Brazil-Election-Meddling"> New York Times Editorial Illegally Promotes Brazil Election Meddling</a>. Related coverage: <a href="https://thegoldwater.com/news/35100-New-York-Times-Editorial-Board-Again-Meddles-In-Brazil-Elections-Now-Slamming-Bolsonaro "> New York Times Editorial Board Again Meddles In Brazil Elections, Now Slamming Bolsonaro</a>. 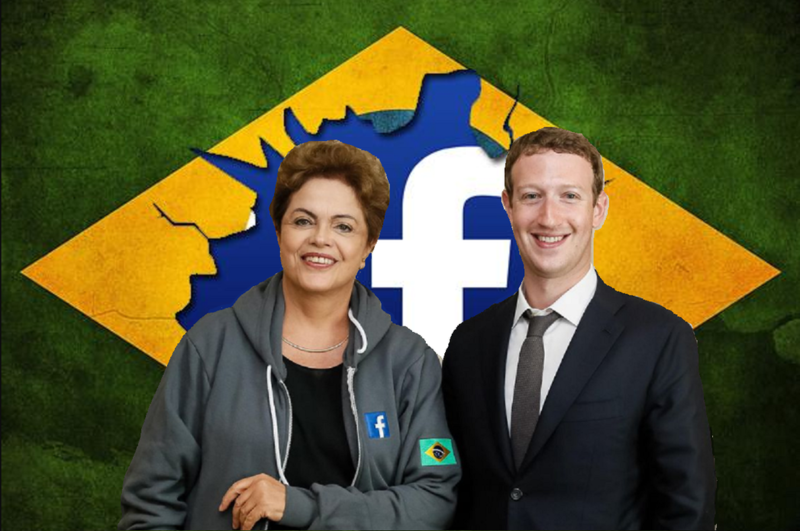 Knowing that the Brazilian presidency will for the first time be decided not by TV but by internet as the trust of average Brazilians in their media dropped, the Worker’s Party luckily knows that it can count on Silicon Valley behemoth Facebook, with whom it signed a cooperation agreement in 2015 during the Summit of the Americas, where CEO Mr Zuckerberg was pictured at multiple occasions discussing the matter with then President Dilma Rousseff. Facebook reaches an audience of some 150 million users in Brazil, which is its second-largest users base after the US. According to the social networking website's head of strategic mobile partnerships and local director Ms Laura Gonzalez-Estefani, Facebook wants to expand into Latin America from Brazil, which has one of the best Internet penetration percentages in the region. Furthermore, Facebook is not bent on changing its partnership this time round given the time already invested in the relationship with the Workers Party, no matter what the Brazilian voters would want. The signs on the wall became clear already in July when the Silicon Valley company started blocking various conservative pages on Facebook Brazil urging youngsters to support Mr Jair Bolsonaro. The timing, in the middle of summer, made sure that the news was reported but didn’t spread very far. However, anyone now wanting to open a new Facebook page dedicated to Mr Bolsonaro is reminded of Facebook’s ‘general rules’ and blocked soon after, leaving many on his supporters to unite on alternative platforms like Gab and 8chan. As there is a general consensus with political analysts that Mr Bolsonaro's current statistical advantage in the polls is because the leading popular candidate favoured by the younger generation, Brazilian media is keen on stopping him and bring back Mr Luiz Inacio Lula da Silva of the Workers' Party (PT), who has been in prison since April on corruption charges. Obviously Mr Bolsonaro strongly opposes Lula's freedom and candidacy mockingly stating that he favours a free Lula but "in 2030." As with all fascist regimes they conspire with others to destroy their opponents. They cannot do their dirty work alone. The machine they create to control the flow, or restrict the flow of information is critical. Hitler destroyed all the free press. Now the free press in on the internet. Zuck will do the same thing in Brazil. Zuckerberg is just another nasty, lying, scheming jew. It used to be that elections were controlled through newspapers and such, these days they can just go to the robot in charge of Faceberg and rig it much easier.